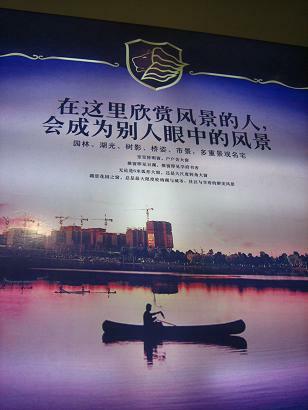 To what extent does real estate advertising in Ningbo build the imagination of a ‘new middle-class’? In her article ‘private homes, distinct lifestyles’, Zhang (2008) argues that the rise of the commercial real estate industry in China is vital to the formation of a ‘new urban middle-class’ culture. On the one hand, the private homeownership reflects class difference to some extent, as Li Zhang said, an ‘index of status’. On the other hand, a ‘class milieu’ is also being created and influenced by the privatization of living space. I agree with her argument that in China nowadays, there has not emerged a distinct class culture shared by those so-called ‘middle class’ in economic aspect. Class making in China will be a ‘long and confusing’ process. In current Chinese society, house is no longer merely a sweet place for family being together, but also a vital representation of one’s social status. As Zhang (2008) points out, the stratification of urban residential space provides a tangible place for people to seek status recognition and create their cultural milieu. As the new rich in China succeed economically, they still lack a sense of social insecurity and yearn for respect from others. Therefore through the consumption of private property, the invisible socioeconomic differences are externalized. Besides a demonstration of one’s wealth, spatial location is also considered as an implication of one’s lifestyle and taste, at least that is what real estate advertising tells people. Zhang (2008) considered the real estate developers in China are not only selling the house to people but also constructing new notions of ‘the middle class’, especially through advertising. By investigating a number of advertising of housing in Ningbo, this essay will explore whether there exist a distinct so-called middle class culture conveyed by real estate advertising. Deng Xiaoping’s reform and opening up policy which was started in1978 has brought China tremendous economic development and remarkable social transformation. There were dramatic changes and rapidly rising urbanization rates in China’s cities as a result of globalization and mercerization. The adjustments of China’s economic structure, the large-scale expansion of the tertiary industry and the acceleration of urbanization process have led to the emergence of a Chinese middle class. There was never a clear definition about the middle class in China. A report by National Bureau of Statistics of China once pointed out the standard of middle class in China is “With a household income of 60,000 to 500,000 RMB”, but they denied it soon after because of the sensitivity of the topic. If only take economic income into consideration, different cities will have different standards due to the unbalanced regional development and consumption levels among Chinese cities. Therefore it is impossible to judge middle class only by incomes. Take Ningbo for example, a long history of doing business makes Ningbo a more commercialized city. Private entrepreneurs and merchants account for a relatively larger part. There are also numerous migrant workers with lower education levels doing labor work or small business. They are working very hard and due to the good business environment in Ningbo many of them may earn money beyond the average level of common white collars. They may have reached the economic standards of middle class but their social status is in a low place due to their occupations. And what is more important is that they do not have a concept of consumption. They earn middle-class money but live a low-class life because they prefer to save money rather than consumption. Therefore, Occupations, consumption habits, educations should also be taken into account when referring to middle class. Generally speaking, China’s middle class should be such a group of people: they have decent jobs with incomes that no less than the average level so that they do not have to struggle to make ends meet. They own houses (although on mortgage), cars, stocks and other movable or immovable property. They live a relatively decent life compared to those live in the bottom, but far from the living standard of the affluent class. They are eager to live a better life with less money and place great emphasis on the quality of life but are more rational than the affluent class in terms of consumption habit. Since the early 1990s, real-estate industry has experienced a big boom due to widespread economic and land reforms. Then the housing reform in 1998 makes house no longer a welfare item provided by work unit, but a commodity (they are called ‘consumer housing’) can be owned privately by the masses. According to recent surveys by the Sohu.com website, real estate has become the most profitable industry in China with more than RMB2.5 trillion currently invested. Cities already account for 75 percent of china’s GDP and this is expected rise to 90 percent by 2025 (Liauw 2008). As an important pillar industry of China’s national economy, the last decade has seen an unprecedented prosperity of real estate industry in China. The enormous potential profits in China’s property market have led to a rapidly expanding of real estate industry. The residential property price, take Ningbo for example, has increased about five times in the last ten years. On the one hand, real estate industry plays an important role in China’s economic development and is a major source of local governments’ tax revenues. Super-scale real estate development project was considered by Zhou (2008) as one of the modern utopian visions in China, along with skyscrapers, mega-structures and super-wide roads, being the political gain of government rather than mere marketing. On the other hand, the private residence price is far beyond the economic capacity of ordinary people. With rocketing property prices in urban China, it is very difficult for middle and low income citizens to afford a decent house. It usually cost a people’s life savings to purchase a house of their own. Despite how expensive it is, owning a house is still considered as a “must” in the concept of majority Chinese people. For example, it is difficult for a man without a house to find a satisfying wife. House is considered as an essential element of marriage in nowadays China, thus the emergence of “Fang Nu” (‘slave of house’ in the Chinese language), which means one bought a house with a mortgage for 20 to 30 years and almost the rest of his life are working for paying the debt. While the affluent class buying villas or townhouses (usually more than one) with cash, the urban middle class can only afford a flat with mortgage for several tens of years. Furthermore, we are living in a world flooded with house advertising made by real estate developers, which created an illusion that you will live a happy and honorable life as long as you buy a house. ‘Nobles’, ‘elite class’, ‘new rich’, ‘the few’ ‘new gentleman class’ are the most frequent words in those advertising to represent their targeting group. Most of the time we do not see any house in a house advertising but wines, violins, ballet, golf, elegant ladies in evening dresses and gorgeous parties, all the symbols of a classy lifestyle. 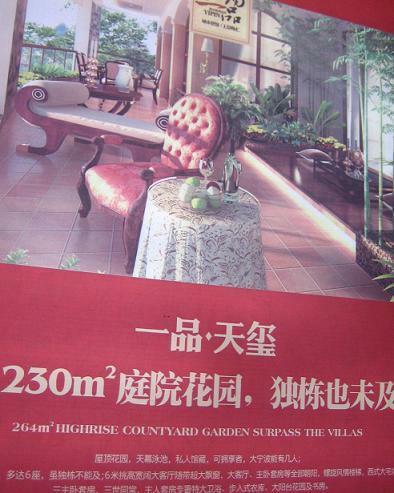 The real estate advertising I analyzed here are mainly from the 7th China International Housing & Furnishing Exposition (CHFE) held in April 2009. CHFE, which is held in Ningbo International Conference and Exhibition Center twice a year, exhibits products of real estate, building materials and housing decoration etc. CHFE displays the latest achievements and development and to a great extent reveals the trend of the industry. This time, About 20 real estate developers exhibited their products there, most of which are for residential use. The type of residences range from 40 m2 apartment to 300 m2 villas, but most of them are flats between 90 m2 to 140 m2, which are targeted at the middle class. By looking at the real estate advertising at the 7th CHFE, I find that there are flooded with western elements. Some are full of images of western faces. Some buildings are portrayed as British style, Spanish style or any other foreign architectural style, even straightly named as Residence of the North Europe. Some are claimed as designed by foreign architects. For example, advertising by the project Art Deco reads, ‘the landscape is designed by Hassell of Australia’. ‘British-style butler service’ is also a very popular word among those advertising. Western lifestyle has always been considered as a superior lifestyle by Chinese people and Euro-style is currently one of the popular architectural flavors. Just as Liauw (2008) points out, the emerging patterns of urban consumption such as mixed-use Central Business Districts (CBDs) or European-themed suburban villas–the new lifestyle aspirations of new middle-class workers–represent ‘a deeper-rooted “coming out” of Chinese urban pride that demands ever more spectacular and different architectural designs’. The westernization tendency could also be observed from their exhibits. Most of the real estate exhibits were decorated luxuriously with western style. Pianos and violins are played there showing an upper class lifestyle. The most impressive scene to me is that a girl played piano in an exhibit corner decorated with classic western elements: oil painting, plaster model and fireplace. It is also interesting to find out that almost all the real estate billboards are ‘bilingual’. Every project has an English name. Some are not really English, but just Chinese ‘Pinyin’, which is made of English letters so looks like English. Apparently, they are not going to sell those houses to foreigners, because English is more a decorative thing here to make the advertising a superior look. Some are full of spelling and grammar mistake that even British people may not understand the meaning. 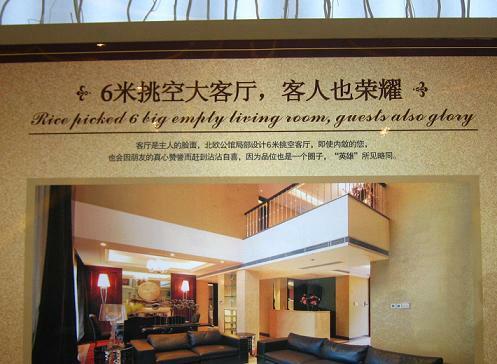 Such as ‘Rice picked 6 big empty living room, guests also glory’. (Apparently the education level of the advertising designers is not high. In fact, I have already found out that the general quality of real estate advertising in Ningbo has lagged far behind big cities like Shanghai no matter in terms of creativity or concept. 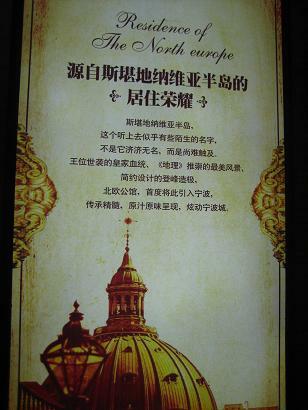 Ningbo is making advertising that Shanghai made several years ago. Suddenly I realized that real estate advertising is a good combination of creative industry and real estate industry. I can know about the quality of people working in creative industry from real estate advertising.) Back to the topic, some English sentences are in very small font that people can not read at all, just knowing they are English letters. Some sentences are totally irrelevant to the advertising. The most ridiculous one is on a billboard by Ningxing City Garden, which reads ‘you changed your master’s degree…from computer science to…so you could participate in…’ It seems like the advertising designer randomly picked it from somewhere just to decorate the advertising. 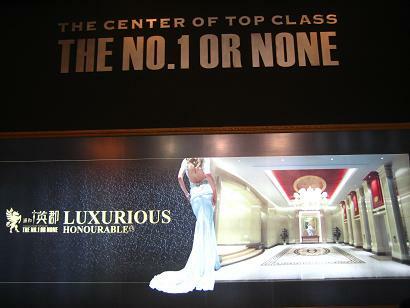 The other popular selling point real estate developers want to convey to their potential customers is an honorable lifestyle, which is also embodied in the name of the projects, such as ‘Top Town’, ‘The Center of Top Class’, ‘Crown Garden’, etc. Five-star treatment, British-style butler service, honorable, luxurious, glory, royal are the most used words. Take a project called Jiangnan Yinpin(First Rank) for example, which is one of the largest complex real estate projects in Ningbo. Its products include high-end residential apartments, office buildings and business streets, with targeting group of middle and upper class. 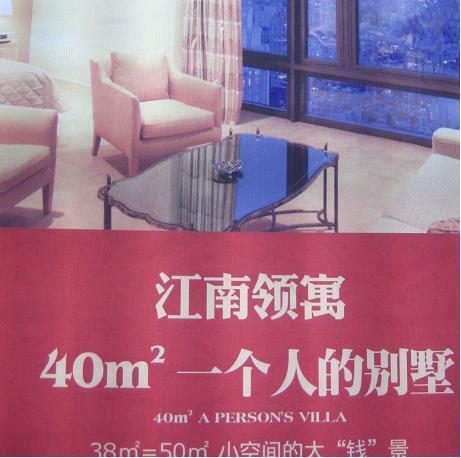 The areas of its residence range from 40 m2 apartment to 410 m2 they call Monolayer, but interestingly, all the residence are called Villa or surpass the villas in the advertising, even it is just a small 40 m2 apartment. For example, ‘40 m2 a persons villa’, ‘89 m2 first rank loft villa’, ‘264 m2 high rise countyard (courtyard) garden surpass the villas’, ‘Top-layor (layer) garden villa with a(an) atrium pool’. There is another selling point that can not be ignored, that is being close to nature. Garden is the most frequently used word whether in the name of projects or in the advertising. ‘Spring Garden’, ‘Lake View Garden’, ‘City Garden’, ‘Nine Scenery Garden’, ‘East Splendid Park’, ‘Crown Garden’, etc. Houses are usually beautifully portrayed with blue sky, clean water, lovely birds and green gardens. Those advertising are designed to cater for the urban middle class’s desire of being far away from the noisy city and growing thirst of a peaceful life. To sum up, the real estate advertising in Ningbo clearly conveyed three distinct aspects of middle class culture: longing for a classy lifestyle, western worship and a desire for nature. On the one hand, the middle class are eager to demonstrate their social status by consuming a decent house. On the other hand, they also want to be distinguished from the affluent class which usually being considered as with less education and taste. They are eager for a top class life without having a clear concept of what a top class life really is. Then numerous advertising keep telling them what the top class life should be by creating a utopian world. Liauw, L 2008, ‘Leaping forward, getting rich gloriously, and letting a hundred cities bloom’, in L Liauw (eds), New urban China, Wiley, London, pp. 6-15. Zhang, J 2008, ‘Urbanization in China in the age of reform’, in L Liauw (eds), New urban China, Wiley, London, pp. 32-35. Zhang, L 2008, ‘Private Homes, Distinct Lifestyles: Performing a New Middle Class’, in L Zhang & A Ong (eds) Privatizing China: Socialism from Afar, Cornell University Press, Ithaca, pp. 23-40. Zhou, R 2008, ‘Leaving utopian China’, in L Liauw (eds), New urban China, Wiley, London, pp. 36-39. The last decade has seen a big boom of real estate industry in China. The residential property price, take Ningbo for example, has increased about five times in the last ten years. On the one hand, real estate industry plays an important role in China’s economic development and accounts for a large part of the government revenue. On the other hand, the private residence price is far beyond the economic capacity of ordinary people. It usually cost a people’s life savings to purchase a house of their own. Despite how expensive it is, owning a house is still considered as a “must” in the concept of majority Chinese people. It is difficult for a man without a house to find a satisfying wife. House is considered as an essential element of marriage in nowadays China, thus the emergence of “Fang Nu” (slave of house), which means one bought a house with a mortgage for 20 to 30 years and almost the rest of his life are working for paying the debt. Furthermore, we are living in a world flooded with house advertising made by real estate developers, which created an illusion that you will live a happy and honourable life as long as you buy a house. 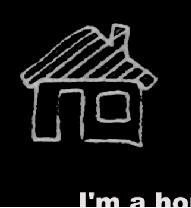 My video tells a story in the eye of a “house” with an ironic tone. Most of the pictures were taken at the 7th China International Housing & Furnishing Exposition (CHFE), and others are from the billboards, buildings and construction sites in Ningbo. By looking at the real estate advertising at The 7th CHFE, there are mainly three selling points developers usually focus on: noble treatment, western lifestyle and close to nature, which also can be seen from the project names, such as ‘Residence of the North Europe’, ‘East Splendid Park’, ‘Top Town’, ‘The Center of Top Class’, ‘Spring Garden’, ‘Crown Garden’, etc. The most used words are: honorable, luxurious, glory, royal, five-star treatment, English property service, top class, private, swim pool, peaceful, green land, ecological. The most popular scene is blue sky, clean water, birds, green gardens, peaceful life, and luxuriously decorated house. 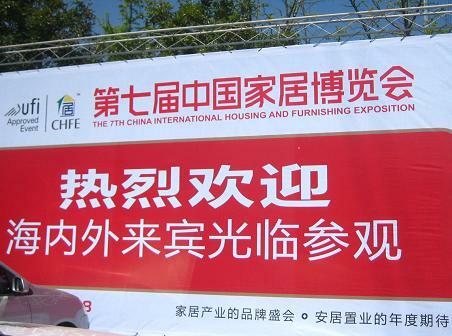 The 7th China International Housing & Furnishing Exposition (CHFE) held in Ningbo International Conference and Exhibition Center on April 10-13, 2009. CHFE exhibits products of real estate, building materials and housing decoration etc. 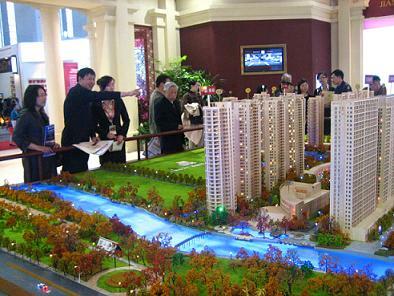 About 20 real estate developers exhibited their products there, most of which are for residential use. Most of the real estate exhibits were decorated luxuriously with a western style. Pianos and violins are played there showing an upper class lifestyle. The most impressive scene to me is that a girl played piano in an exhibit corner decorated with classic western elements: oil painting, plaster model and fireplace. It is also interesting to find out that almost all the real estate billboards are ‘bilingual’. Apparently, they are not going to sell those houses to foreigners. English is more a decorative thing here to make the advertising a superior look. 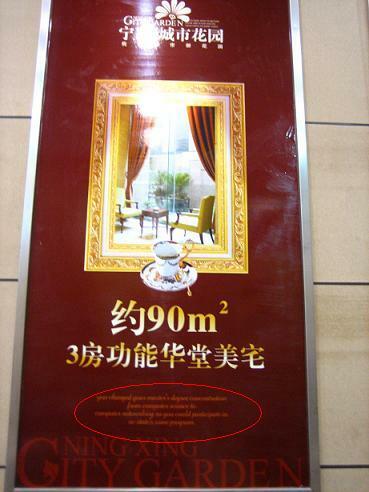 The most ridiculous English sentence is on a billboard by Ningxing City Garden, which reads ’you changed your master’s degree…from computer science to…so you could participate in…’. It seems like the advertising designer randomly picked it from somewhere just to decorate the advertising. According to Van (2009), at present, the network cluster formed with accumulation regime. Additionally, creative cluster is the sub-cluster from industrial clusters. There are some connections between urban development and competitive power ，when one company was classifying into creative industry spatial agglomeration. Van mentioned, originally, in Berlin, some real estate of important creative cluster was organized by shareholder project format. Afterwards, from 2004 it’s transformed into ‘regional management’. In other words, the government intervenes in this area and begins to corporate with real estate developer. In London, even the spatial clusters were sorted out ambiguously, the tendency of creative cluster is exist. Van also uses Maskell(2001) notes to analyze cluster and development in creative industry from the three aspects. First of all, some firms are willing to relocate or partly relocate into cluster for potential customers in such area. 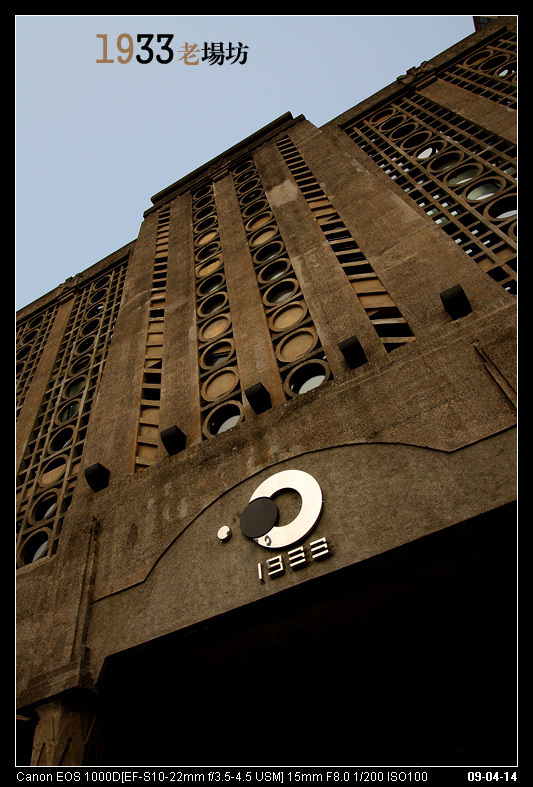 For example, the Magazine of Urban China relocated their Shanghai Branch office instead of moving in one of creative industry park in Yangpu District. In addition, some dominant tendency also will lead some firms to think about what sector of creative industry they should get involved in. Give an example, In Ningbo, the project of Industrial Design and Creative Park will give lots of opportunity for design studios and advertising companies. Owing to this creative park already have some relationships with manufacturing companies in Ningbo. 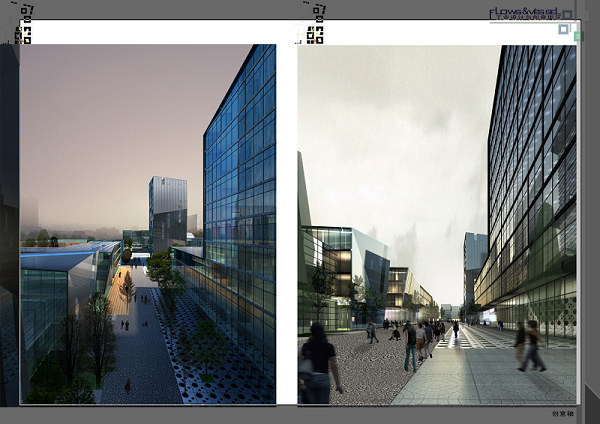 According to Hu (2009), on account of the small medium scale manufactures in Ningbo had developed very well. However, if they want achieve better performance; the reality is that their ability is limited for reason of lack of industrial design skill. Therefore, in such situation, design studios in the Industrial Design and Creative Park will definitely have closed relationship with these enterprises. In other words, small medium scale manufactures could benefit from design and their products appearance will be showed in such creative park. In the end, products will get great demand. On the other hand, design studio also could through these designs to demonstrate their strength and gain money. Finally, the phenomenon of new firms as the spin-offs in cluster becomes more and more common in daily life. Because of technical shift and commercialization, such companies are the good places for staff to expand their imagines and creativity. Do those company forms appear in Ningbo? Next step, I want to interview some persons and figure it out. Hu, Haizhong & Xiao Yingzhe 2009, ‘On interactive relationship between Ningbo constructing industrial park and developing small-medium scale manufactures’, Journal of Zhejiang Wanli University,vol.22,no.1,pp.83-86. What do the features of spatial cluster or the spatial agglomeration mean? Evaluating with references such as Van to discuss how Ningbo’s creative industry connect with urban development. In current Chinese society, house is no longer merely a sweet place for family being together, but also a vital representation of one’s social status. As Zhang (2008) points out, the stratification of urban residential space provides a tangible place for people to seek status recognition and create their cultural milieu. As the new rich in China succeed economically, they still lack a sense of social insecurity and yearn for respect from others. Therefore through the consumption of private property, the invisible socioeconomic differences are externalized. Besides a demonstration of one’s wealth, spatial location is also considered as an implication of one’s lifestyle and taste, at least that what real estate advertising tells people. Zhang, Li (2008) ‘Private Homes, Distinct Lifestyles: Performing a New Middle Class’, in Li Zhang and Aihwa Ong (eds) Privatizing China: Socialism from Afar, Ithaca: Cornell University Press, pp. 23-40.